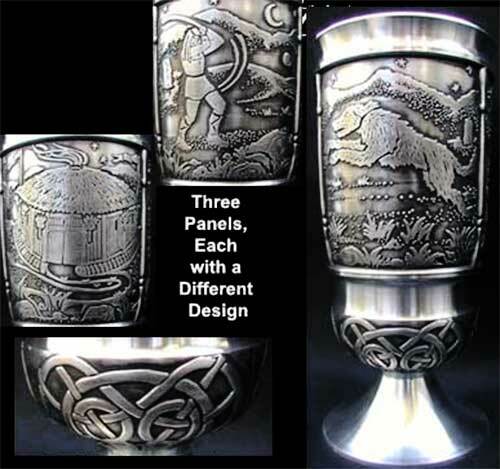 Celtic goblet features pewter construction that is enhanced with embossed panels depicting the Irish legend of the Hound of Culainn. This Irish goblet is hand-made from lead free pewter. This Celtic goblet is a pewter vessel that features three embossed panels that depict the Irish legend of the Hound of Culainn. The Irish legend goblet is further enhanced with embossed Celtic knot-work below the panels. The pewter goblet holds 10 ounces and stands 6" tall. The Irish goblet is made in Ireland by Mullingar Pewter and it is gift boxed with a Celtic knot history card, complements of The Irish Gift House. The Irish Legend of the Hound of Culainn. In Ireland many legends which are true in essential content were often embellished with fantasy by the storytellers of two thousand years ago. These people were brilliant at their job. This is the story of the one young man named Setanta (pronounceed Shay-tanta) who earned the name Cu Culainn (Koo Cullen) due to his spirit of generosity. Setanta lived near Dundalk and was a nephew of King Conor Mac Nessa who reigned over Ulster during the lifetime of Christ, and of whom Conor was unaware. A warrior group called the Red Branch Knights was maintained by King Conor at his palace on the hill of Eamhain Macha from which Armagh got its name. The kights in their turn trained a boy corps. Maybe they were the original boy scouts of today. Called Macrad, they were famous for their powers at hurling, hunting, music and poetry. Setanta heard about this elite corps in Armagh. Leaving Dundalk to join them he carried his throwing javelin with him, also a lance and his best hurling stick. Arriving in Armagh after the walk from Dundalk he was elated to see a hurling game in progress. He recognized correctly, the Macrad boys and without asking ran onto the field and joined in the game. This was the wrong thing to do because the Macrad boys became very very annoyed with this stranger. They stopped the game and would have injured Setanta but, unfortunately, good sense prevailed. So, brought before King Conor he declared to the royal court that he was no stranger but the son of the king’s own sister. Immediately the welcome was profound. The Macrad boys apologized and Setanta grew in skill as a great hurler of much power and accuracy. Once the feast began the king forgot about Setanta coming late and had informed his host that all entitled to come in the royal party were present in the fort. When young Setanta duly arrived near the fort he found the gates closed against him and guarded by a wolfhound specially trained in ferocity. Setanta held back as the dog growled in a menacing way. Always carrying his Hurley stick with him he took from his pocket a small brass ball and moved slowly towards the gate all the while keeping his eyes on the hound. With teeth bared the hound attacked with giant strides. As it came towards him Setanta played the ball. It jammed in the dog’s mouth and choked him. Culann’s dog died. The host, hearing what happened, was distraught at the loss of his favorite hound and protector. Equally upset was the boy Setanta. So much so that he prevailed on Culann to allow him to take the place of the hound and guard the fort and the person and property of Culann himself until another dog could be found and trained. It was a most honorable undertaking so the king approved of it. So too did a delighted Culann. Far and wide Setanta became known as the Hound of Culann, that is to say, Cu Culainn. From that time onwards fortune favored Cu Culainn and he became one of the greatest leaders Ireland has ever known. Whenever the Irish gather, the wonderful game of hurling is played today under modern rules and using the same ancient skills. Also the wolfhound is now a big, gentle, much loved dog of aristocratic bearing. Celtic goblet features pewter construction that is enhanced with embossed panels depicting the Irish legend of Cuchulainn and Ferdia. Celtic goblet features pewter construction that is enhanced with embossed panels depicting the Irish legend of the Salmon of Knowledge. Celtic goblet features pewter construction that is enhanced with embossed panels depicting the Irish legend of the Children of Lir.